Over the past decade, a self-effacing artist named John Mavroudis has quietly become a player in the noisy world of rock posters. 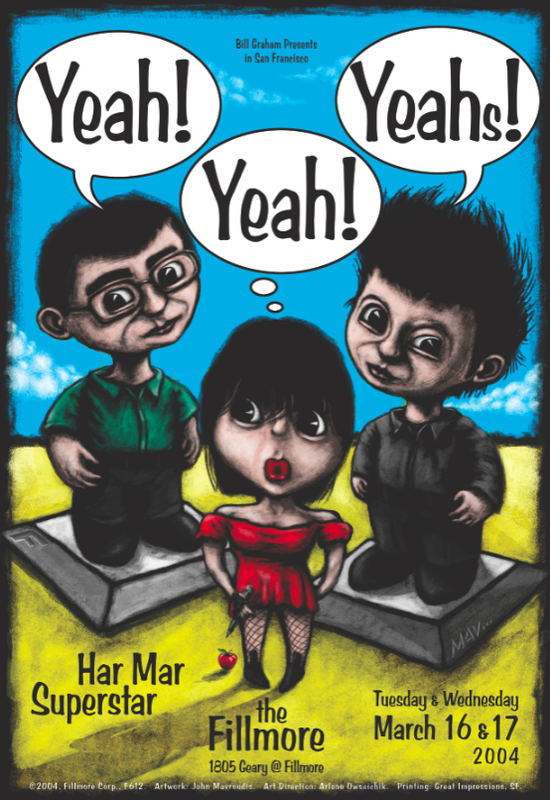 Mavroudis was officially made a member of the scene in 2004, when he was given his first assignment to create a Yeah Yeah Yeahs poster for San Francisco’s fabled Fillmore Auditorium. That important rite of passage was followed in 2011 by his first commission from a Bay Area band called Moonalice, which has produced an original poster for each of its 500-plus shows since 2007 (in a unique arrangement, the posters are given away for free to fans in attendance, then sold later by the band and the artists, who share the copyright). 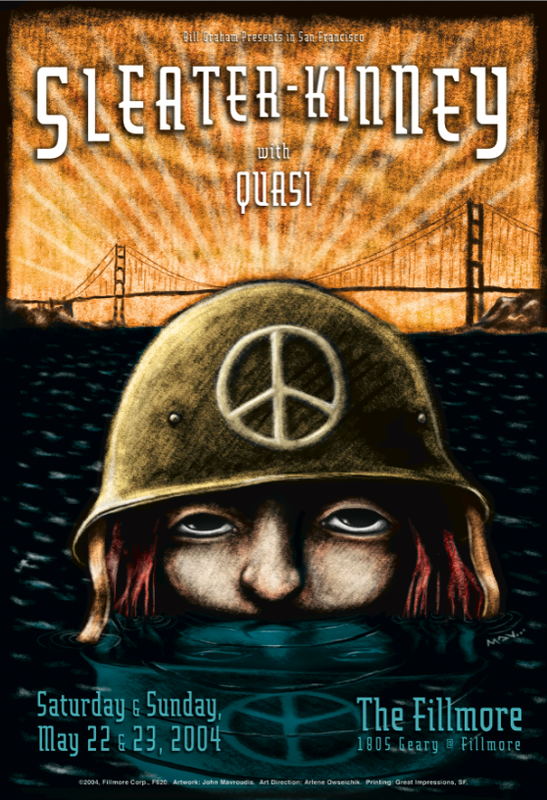 This weekend, on Saturday August 18, 2012, Mavroudis joins 20 or so other poster artists from around the United States for an exhibition called Rock Art by the Bay, which is being held at The Cannery in San Francisco and is presented by The Rock Poster Society (or TRPS, as it’s known). On hand will be local contemporaries such as Chuck Sperry, Chris Shaw, Alexandra Fischer, Marq Spusta, and Ryan Kerrigan; icons from the 1960s and ’70s such as Stanley Mouse, David Singer, Lee Conklin, and Randy Tuten; and a handful a guest artists visiting from around the country, including Gary Houston from Oregon and Jeral Tidwell from Kentucky. 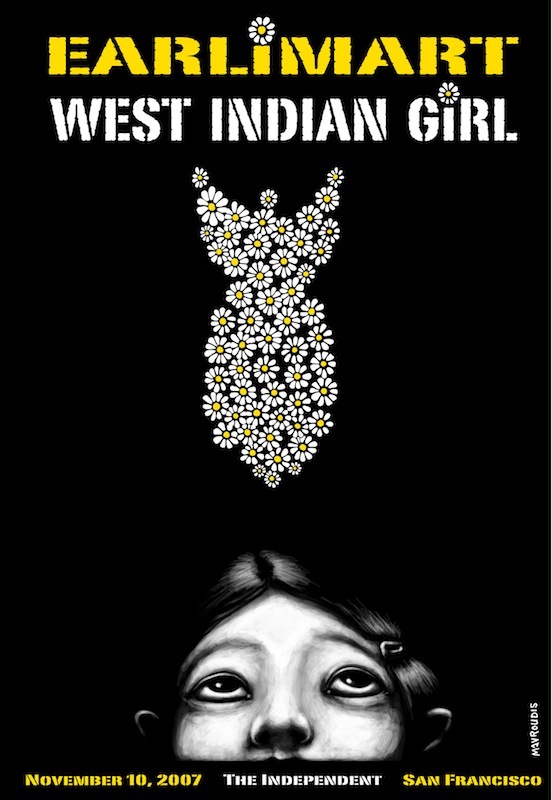 Above: A 2007 screenprint for a show by Earlimart and West Indian Girl at the Independent in San Francisco. 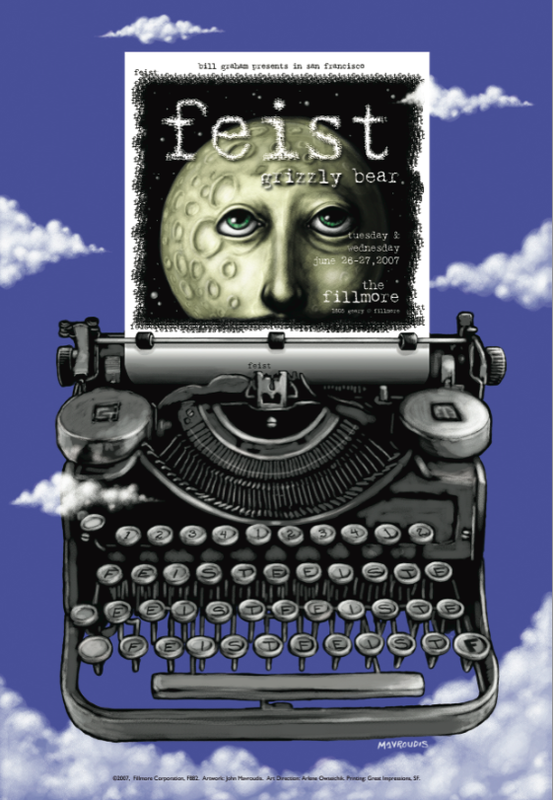 Top: Feist at the Fillmore, 2007. Sleater-Kinney at the Fillmore, 2004. 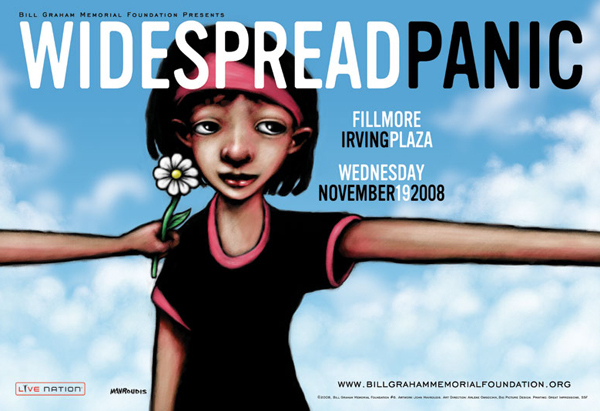 Widespread Panic, 2008, Irving Plaza, New York. 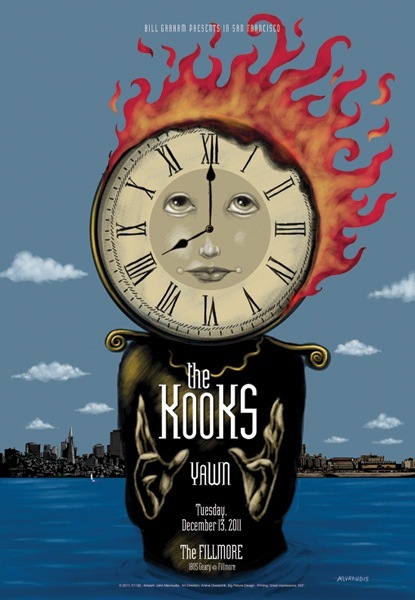 The Kooks at the Fillmore, 2011. The Yeah, Yeah Yeahs at the Fillmore, 2004. Somewhere along the line, Mavroudis got a full-time job with the California Film Institute, where he’s an art director. And in his off hours, he managed to find the time to submit cover ideas to “The New Yorker” (he’s had a few of his pitches purchased by the illustrious magazine, but so far, no cover bears his signature). 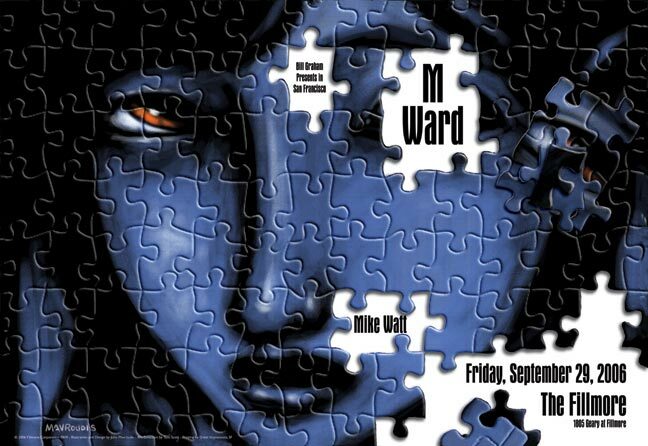 M Ward at the Fillmore, 2006. 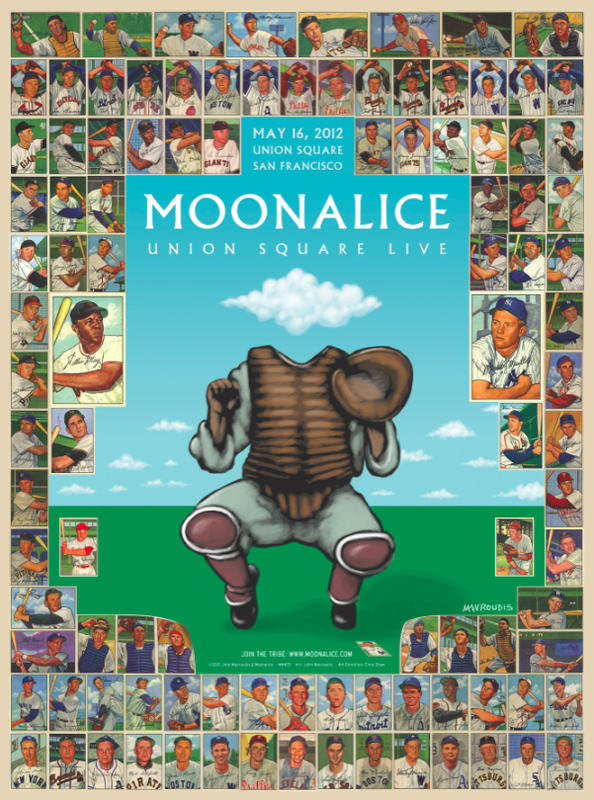 This poster for a 2012 Moonalice show features reproductions of the entire Bowman 1952 set of baseball cards.